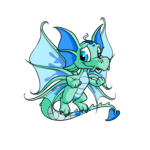 Anyone who has been playing Neopets for a while, remembers how Faerie Neopets used to look like. After the introduction of wearables, the pet art was changed. Some Neopets were grandfathered (so-called unconverted) whereas others were converted automatically, meaning their old art style became lost forever. UC pets are generally coveted and highly sought after, Faerie UCs are certainly not an exception to this. In this article I've chosen to spotlight a selection of Faerie Neopets, the ones I personally consider to be the most unique and beautiful. Three of them are available in UC versions, whereas the others were released in Faerie after the redraws. I have chosen to not include the unconverted versions of any Neopets in this article, as I wish to highlight the new and updated art. I also ran a poll on the HC and Charter (Premium board) to find out what non-UC Faerie Neopets were the most popular. Ixi, Grarrl, Hissi, Xweetok and Eyrie all tied at 9 votes each. The runners-up were Kougra, Peophin and Gnorbu all at 7 votes each. Thanks to everyone who took the time to voice their opinion through this poll! Please note that as this article was written before the poll was run, it did not effect the finished article which is based solely on my personal opinions. Below I`ve chosen to list the Faerie Neopets not in alphabetical order, but based on how much I like each of them. There is something amusing about a large, bulky Neopet with faerie wings... or rather, the amusement comes from picturing them in flight. The Faerie Skeith`s wings are large, but fragile and delicate looking. One might be tempted to say that it seems unlikely that this Skeith would ever leave the ground, as his wings don`t appear strong enough to support his weight. In any case, the Faerie Skeith has a dark turqouise colour not found on any other Faerie Neopet. The solid block of colour is broken up by some purple spots and his spikes are a fresh lime green. Note also his cute antennea and his purple nose, which in combination with the bright colours helps soften the somewhat stern expression of this species. With his purple and green colours, the Faerie Nimmo looks like he`s been inspired by the Dark Faerie Jhudora! There is nothing scary or malicious about this Neopet, however. Nimmos are quite peaceful, and with a set of large, pretty wings your Nimmo can fly high above the lily pond and be the envy of all the other Nimmos and Quiggles. There are several Faerie Neopets with a plain yellow base colour, but none sport the warm, sunny shade of the Faerie Tuskaninny. Although native to Maraqua, a single lick of the right paint brush can have your Tuskanninny flying around Faerieland in no time! This Faerie pets wings are quite unique, with only the Flotsam coming close to matching them. The red markings on his face and tail also gives him a cute and special appearence. I personally feel the cute Tuskaninny is an underrated species that deserves more attention, and as the Faerie Tusk is rather special I felt it deserved a place in this article. The fact that the Faerie Mynci has blue shades in this pb colour, may come as a surprise considering their natural habitat is the jungle of Mystery Island. You may have expected him to have green faerie wings, similarly to the Usul and Chomby, but I personally enjoy these blue hues and how harmonic and downplayed they are, considering how some Faerie pets are too plain and others have very bright colours. The Faerie Mynci gives your eyes a welcome rest. The butterfly wings are really pretty, and I like the hairtuft as it gives him a male appearence which serves as a nice contrast to many of the very girly looking Faerie Neopets. As this species mainly requires morphing potions or lucky lab zaps to be created outside of their own pet day, it`s not hard to understand why there aren`t flocks of Faerie Lutari to be seen around Neopia. Nevertheless, this Faerie pet deserves some consideration, just look at how pretty he is! I like how the Lutari`s usually jagged patterns have been softened by the Faerie Paint Brush, plus the big, beautiful wings really does the PB colour justice. The Faerie Lutari has a nice blend of blue and green hues, perhaps a clever nod to how they`re equally comfortable underwater as on land. Although the Lutaris are native to the island that bears their name and are excellent swimmers, they`re quite adaptable and can live in both hot and cold climates, just ask Mr. Chipper who is in charge of the ice cream cart in Happy Valley on Terror Mountain! If you like your Neopets to be different and original, a Faerie Meerca is a perfect choice! 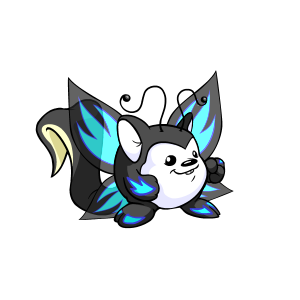 The only Faerie Neopet to have a black and white base colour, he`s certainly eye catching. True, the unconverted version is great too, but the new one is just as worthy of attention. 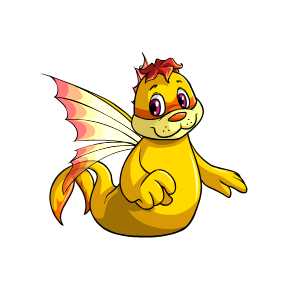 The bright blue on the wings and paws of the Meerca creates a cool contrast to the base colour, and like several other Faerie Neopets, the Meerca also has a pair of antennea. To be honest, I`m not the biggest Moehog fan. I think they`re cute, but I`ve never wanted to own one myself. However the Faerie Moehog has got to be one of my favourite colours for this species next to Baby. The colour palette here is gorgeous. I really like the light purple base mixed with turqoise and I think the swirly decorations on the pretty wings and the half-moon shaped mark on the side of her body are very nice touches. The Faerie Moehog is also one of the extremly few Faerie Neopets where the UC version and the converted one don`t look drastically different. The Faerie Grundo is my second favourite in this paint brush colour. I love the dark midnight blue, how it`s simple and clean without being plain, and the beautiful wings that look like they`ve been decorated with twinkling stars. 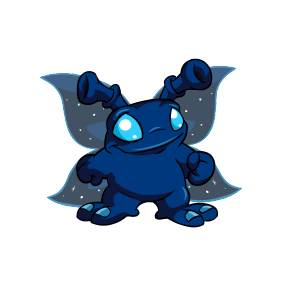 Your thoughts get immediatly drawn to starry night skies and the dark vastness of space when looking at this unique Faerie Neopet. He is almost identical to how he used to look in the old circle pose, which I`m sure made the transition to the new art smooth and easy for anyone who owned (or wanted to own) a Faerie Grundo prior to customisation. 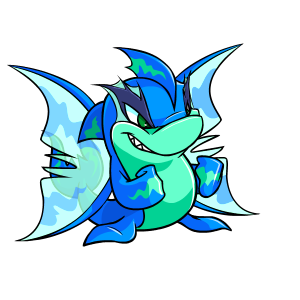 Before we get to my top personal pick of the most fantastic Faerie Neopet, here is an honourable mention to the Faerie Jetsam. It`s a shark with wings. It`s awesome. Also it reminds me a lot of Electric with its completly unique stripy pattern. 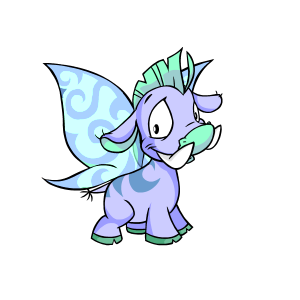 This is one fantastic Faerie Neopet! My personal favourite, and I even own one myself. 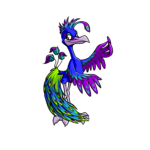 This Eyrie is the only Faerie Neopet with this gorgeous, moss green base colour, and similarly to the Faerie Nimmo he has a blend of green and purple hues. Even with the light shades of blue and pink mixed in, this pet doesn`t look to crowded with colour in my opinion. I think the semi transparent wings look wonderful combined with the solid dark body of the Faerie Eyrie, and the slightly lighter coloured beak is a nice touch. Note also how his tailtuft sports two colours, a feature the Faerie Eyrie shares with Eyries of the following colours: Camouflage, Fire and Split. Of the pets listed in this article, only the Meerca, Moehog and Tuskaninny were available to be painted Faerie before the conversion/redraws and all three exist in UC versions. Going to buy a paint brush? Always check to see if there is a MP available for the species and colour combination you`re looking for. In many cases a potion is cheaper than the brush. Feeding a morphing potion to your Neopet will turn them into the species and colour the potions name indicates, such as White Peophin Morphing Potion turns your pet into a White Peophin, etc. The Faerie colour is also available from a Fountain Faerie Quest and the Secret Lab. 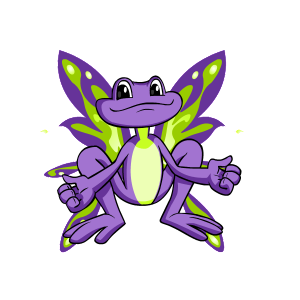 What is your favourite non-UC Faerie Neopet? Which ones do you think should have been included on this list? I hope you enjoyed this article, feel free to check out the others I've written and NeoMail me with any comments.